They are no longer on display at the Aquarium. These velvet ants live in meadows, clover fields, at forest edges, and deserts. The body of cowkiller ants consists of two parts, a thorax and abdomen. There is a slight constriction between the two. They have a hard exoskeleton that is shed periodically. Males have transparent black wings and females are wingless. Antennae are straight and beadlike. The thorax and abdomen of these wasps are red above and covered with short red hairs. The body below and the head are black. The largest velvet ant species, cowkillers are 15-25 mm (0.6-1 in) long. Females are slightly larger than males. 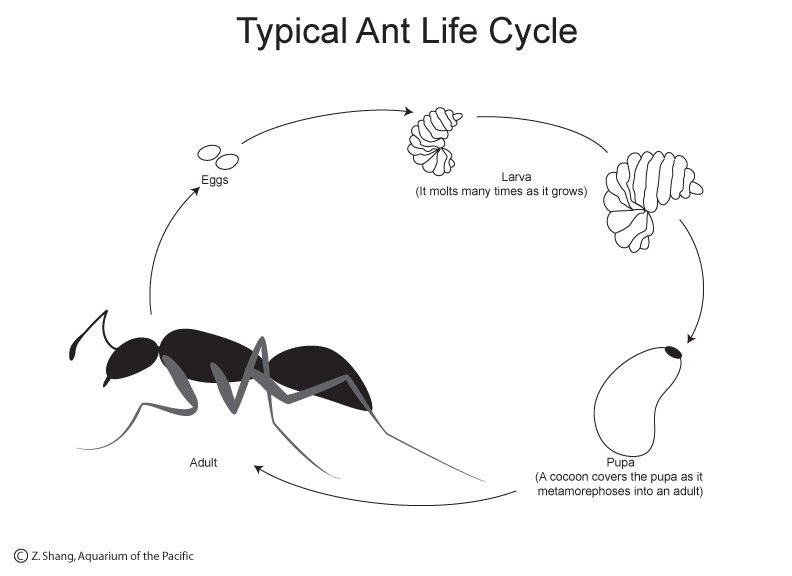 Adult cowkiller ants primarily feed on nectar but they will also eat larvae and adult insects, such as flies, beetles, bees, and other wasps. Velvet ants seen walking on sand are all females. Those seen flying low over the ground are all males. This genus, unlike many other velvet ants that are nocturnal, is active from sunrise to sunset. Female cowkillers have a very efficient and powerful stinging apparatus. The curved needle-like stinger concealed at the tip of the abdomen is nearly as long as their abdomen and because of its length and maneuverability it can be directed at quite an angle from the abdomen. They are able to sting multiple times. The exoskeleton of these wasps is like an armor plate. It prevents water loss and also supplies protection form predators, especially from stings of host wasps in burrows that a nesting female is invading. Cowkillers are not on the IUCN Red List or any lists maintained by US or state agencies. Usually they do not reach pest status, although they may occasionally invade residences. California has about 100 species of velvet ants, most of which are nocturnal and live in the desert. Velvet ants are definitely different! While they do appear to be velvety, they are wasps, not ants. Males can fly. Females are flightless because they do not have wings. Females can sting: males cannot. As for the cowkiller common name of this species, their sting is not potent enough to kill a cow; however, humans stung by this velvet ant experience such intense pain that they believe the sting could kill a cow.